I hate hearing it; “just wait til their teenagers,” as if by waking up one morning you suddenly have a rebellious, hormonal, above-the-age-of-12 person on your hands. I am not denying the trying days. I am not denying the attitudes. I am not even denying that some love to push your buttons and boundaries. What I am in awe about is that somehow this is suddenly to be expected and just prepared for. Yes. But I was a teen once. I heard what everyone was expecting us to become. I am also the mom that walks in the Super-Walmart and leaves with a heavy heart and hugs my children close. If you don’t want to take my advice as a non-expert, then please just hear me out and take it with a grain of salt, or don’t throw the baby out with the bath water. It starts from infancy. “He’s got colic.” “She’s teething.” “Just wait til their two!” “The threenagers were the worse for me.” “Oh the fives! Ugh, they think they know everything!” “Puberty and hormones are coming!” “I’m so sorry, the tweens are awful!” and then, wait for it…. “Just wait til their teenagers!” We begin to build up this expectancy of rebellious, know-it-all, and disastrous years. So what is the answer? What is my solution? I want you to reflect on something. This is what I have noticed: What started out as “acceptable behavior” for years, suddenly becomes unacceptable because they are “rebellious teens”. What am I talking about? The eye-rolling your 10 year old has been doing, and you let her because “she’s adjusting her hormones”. I am talking about the back-talk your 4 year old did and you allowed it “because it was so cute”. The friends he hung out with at school when he was 8 but you never said anything because “what could you do?” Suddenly, what these teenagers have been dealing with for years suddenly over flows into this “it’s not acceptable behavior”. OR, worse, the attitude that says that they are going to be this way anyway so just go with it. In the Christian culture, its like this final time to push all the Jesus they can into their heart so they won’t have room to think of getting pregnant, doing drugs, or end up in jail. What about the heart of your child! YOUR CHILD! Don’t see these years as something to dread, but a time to build up your relationship! Do you like that pushy-know-it-all friend? You are still the parent but don’t come across as the best buddy that knows it all and has to correct everything. We see this time as a reflection of our parenting, so by golly, its time to make sure they fit our mold. Life is SUCH a pendulum– either we care WAY to much about how our teens act (micromanagement) or we swing to the completely opposite spectrum and have a hands-off approach. I have been watching parents for many years. I see a relationship I love and I observe. Most of the time there is joy but I do see some moments of tenseness. I actually really pay attention to these moms. Because then I know its not all an act but you have no idea what goes on behind doors. It has everything to do with the consistent behavior this parents shows! I love those moms. I remember being a teenager and not understanding why were were something awful. Remember that pendulum I talked about? Well, I’ll be honest– I had a good outward portrait, but a very self-righteous, know-it-all, better-than-thou heart. But you know what? My mom would just correct one thing! ONE! I heard it my ENTIRE “awful” years. “Challice, change your attitude.” That was it. Mom KNEW that it was MY HEART that needed attention. I HATED hearing that all.the.time. HATED It. BUT, it wasn’t something out of the blew that suddenly things weren’t ok now. I heard that since I was 9 years old. I was also disciplined at 14? 15? for such behavior. Here I am 5′ 7″ about 10″ taller than my mom and she still knew that I needed that attitude corrected. She said she never had a problem again. It was never tolerated. I didn’t hate my mom. I had an AMAZING relationship with her. I shared everything with her. I even remember having a conversation that went something like, “What if there isn’t a God? What if all this is made up?” Her response was NOT marching me down to the pastor. It was not a shocked face. It was not a bible devotion and study right away. Her answer? “I’ll pray that you find the right answer. But what do you have to loose if it’s not true? If it is true, you’ll loose everything.” The doctrine may not be the soundest thing that you want to follow for the rest of your life, but for a teen, that is some powerful thinking! And that is all she wanted me to do, think. But, do you see why I shared that? How would you have reacted? Pulled friends away? Shut down media? Just said it was all a phase? I’ve seen and heard all those. We tend to do that, react rather than approach it in a simple-straightforward manner. This post is not to tell you what to do with your “rebellious” teen. 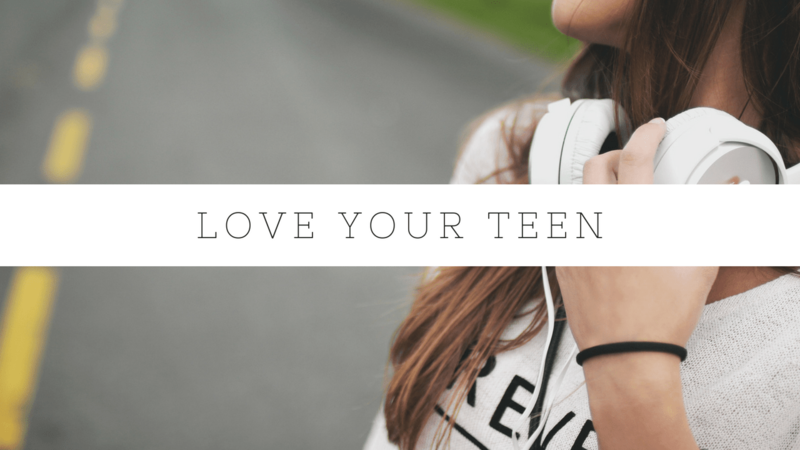 It’s all about just LOVE your teen. Love– powerful. Not superficial with a smile for the camera and clean laundry always ready to be worn. I mean the self-sacrificing love that means you stay up late watching a movie together even though you just want some quiet time. I mean love that keeps your mouth closed while your teen talk about some things that you want to roll your eyes at. I mean love that says, “this is my precious child. I like having him/her around.” Love that listens; is not puffed up, endures all things, hopes all things and believes the best in all things. Love never fails. 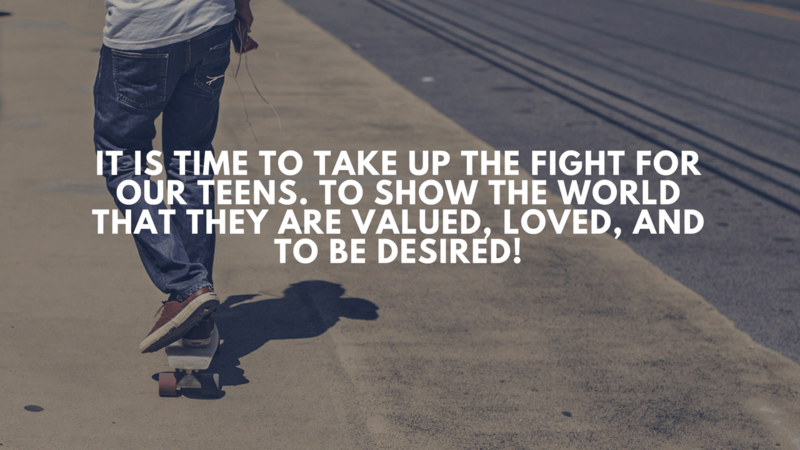 It is time to take up the fight for our teens. To show the world that they are valued, loved, and to be desired! What I love most about posts like these are the books I can glean from it. These are a couple I recommend. I have 4 teens and I have NOT experienced what we hear about. We heard all the warnings too. One Aunt even told us our daughter would sneak out at night and rebell while we were asleep. Never happened. Teens are wonderful!! The only thing that I don’t like is that soon they will be adults and moving on, it went so fast. But they still need me and parenting doesn’t end until death. You’re right though, the attitude is terrible about teens but discipline(discipling) begins at birth and never ends but changes in the different ages and stages. It sounds like you had a wonderful mom. 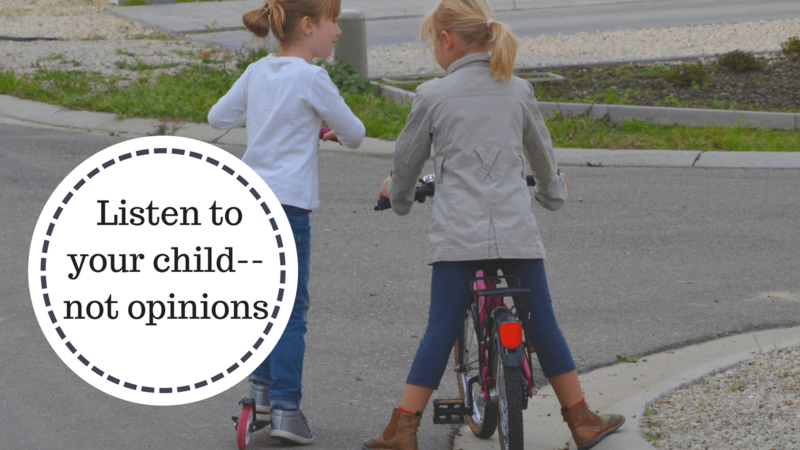 My husband and I had to undo several generations of toxic parenting. We started with parenting magazines with baby #1 and were just sort of flailing about but Godly Christian parents came alongside and I watched them and humbled myself to guidance and counseling. I love my teens. They are great years!!! You’re a wise woman, my daughter. And not because you still speak to me after all the attitude adjustments.